Ideal desat treatment! Congratulations on your top 20 finish. Wow, the one 10 I gave in the challenge and only 17th place. Not a bad score, but really this was a great shot and should have ribboned. Again, great photo. Love the colorized effect. Takes an otherwise ordinary setting and gives it flair. The selective de-sat really works well here. Could be the first time some of the city dwellers have seen a country egg too! Nice work. Awesome picture. I love the color enhancements to the yolk and shell and leaving the white clear is perfect. Nice stop and I think the desat is effective. The weird thing though, as I look at this, I get a strange sense that the yolk is RISING INTO the shell, instead of falling from it. Kind of like I'm watching a video of it is reverse. Strange, I know. Well done! I like the selective desat and the shape of the yolk is very dramatic. this is a tough shot to pull off. it will be interesting to see how others react to it. i kinda like it, but am not too crazy about the shadows and the desatting. Well this is certainly a unique egg shot. ;^) Don't think I've ever seen one quite like this. Good image for doing the selective desat...works well here. Have stopped all motion quite effectively. Should do ok with this one. Good luck. Very good setup - good background items without being too busy. Nice job of stopping the motion. Not sure I like the use of selective desat; in color it might be good for a stock photo. "Great Job" from the "Great Job Baggie"! I originally gave you an 8 on this shot. After 2nd pass through, I'm changing that score to a 10. I love the black and white of the photo with the exception of the eggshell and yolk. There is nothing technically that I can pick apart in this shot. It is quite lovely. Although this is a subject that is limited in it's appeal to those interested in cooking, it's beauty and originality is undeniable. I can see this in poster size hanging on the wall of a breakfast place. You deserve the 10 that I'm giving you. principally because the colour of the shell looks a bit odd. also, the only other real criticism is that the background has a bit of a conflict of ages. there's too much stuff (i think a simple plain or tiled background might be more effective and less distracting), though i love the utensil jar (looks rustic and old) but not too keen on the black circular implement (i get totally lost in the kitchen, don't know what it is) and the modern electrical appliance at the back. also, might have cropped above the tray... ANYway, none of that doesn't mean i don't like it, i do! i think it's cute, it's been greatly captured and timed, fits the challenge really well, and the desat against the yellow is really cool. 7. Oh i like this shot. i think the selective desat plays a good role here but you need a better title, though that may seem a detail. 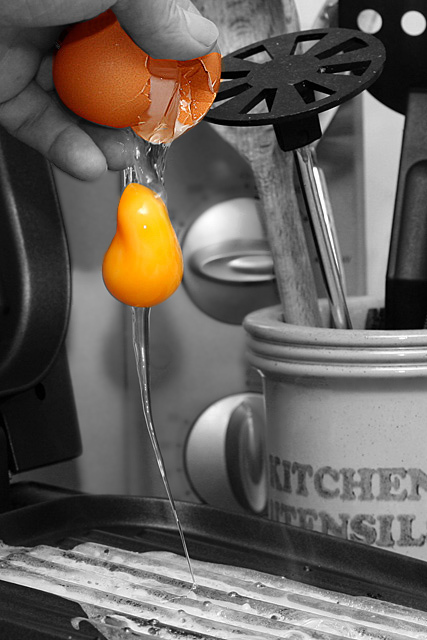 I love how the yolk's shape is distorted by gravity. I personally love picking one or two items to keep in color with everything else b&w. I would however, suggest zooming in during edit and make sure you have all of the shell selected so you get everything. I really like the selective coloring on this one, great job! I would of liked this more with a less cluttered background! Proudly hosted by Sargasso Networks. Current Server Time: 04/23/2019 01:56:33 AM EDT.